More than 120 superintendents, principals, teachers and mental health practitioners from throughout Alabama attended an Oct. 12 conference, “Partnering for School Mental Health: The Power of Collective Impact,” presented by Samford University’s Orlean Beeson School of Education in partnership with The Mike and Gillian Goodrich Foundation. Attendees represented more than 20 school districts and 30 mental health organizations as well as several private schools, Alabama State Department of Education, Alabama Department of Public Health and current Orlean Beeson School of Education undergraduate students. The conference was a continuation of the 2016 Alabama-Finland Summit and the spring 2017 Neuroscience of Learning Conference. Both events were aimed at identifying ways to improve education systems, according to David Finn, Samford professor and member of the event’s planning committee. The event planning committee and School of Education leadership team feel strongly that there is a need to prevent, identify and treat children who are at-risk for mental health issues, Finn added. Through the continuation of conversations from the Alabama-Finland Summit and Neuroscience of Learning Conference, the primary goals for this conference were identified. “We wanted to create an environment and focus attention on this problem so that we can collaborate to investigate ways to create state-wide policies and effective mental health programs for children in our schools,” said Finn. Keynote speaker Olga Price, assistant professor in the department of prevention and community health at George Washington University’s Milken Institute School of Public Health, encouraged attendees to plan and collaborate. “It’s one thing to have a framework but we have to determine how we will take practical steps forward,” said Price. Price is the current director of the Center for Health and Health Care in Schools, a national resource and technical assistance center that promotes positive child health and education outcomes through the advancement of effective school health programs, policies and practices. Attendees heard a genuine account of a student who was failing because she was not completing her homework; meanwhile, she did not have running water or electricity in her home when she left school. “When basic needs are deprived, students cannot focus on the importance of a school project,” said Price. According to Price, more than half of public school students in the United States live in poverty, and the poverty levels are seen equally between urban and rural areas. According to Price the key is a multi-tiered approach with coordinated interventions. “We must think from a whole school, whole community, whole child perspective,” said Price. The afternoon featured breakout session discussions facilitated by local district leaders that were paired with mental health provider partners. Each session highlighted different strategies to building student mental health support infrastructures and different levels of implementation. The Woodlawn Foundation, Birmingham City Schools and Gateway were paired together to share the impacts they have seen from placing Gateway therapists in two Woodlawn Schools. “Seventy-seven percent of teachers have reported seeing improved classroom behavior and performance,” said Collier Tynes, chief of staff at Gateway. According to Gateway, a local school system reported 9,465 incidents of assault, profanity and disruptive conduct in the classroom in just one year. Additional breakout session pairings included, Blount County Schools and J.B.S. Mental Health Authority; St. Clair County Schools, Pell City Schools and J.B.S. Mental Health Authority; Tarrant City Schools and Eastside Mental Health Center; Homewood City Schools and IMPACT Family Counseling; and Jefferson County Schools and J.B.S. Mental Health Authority. Following the breakout sessions, all pairings and participants gathered together to discuss the key points from each session. The overlying theme of each session was the importance of collaboration. 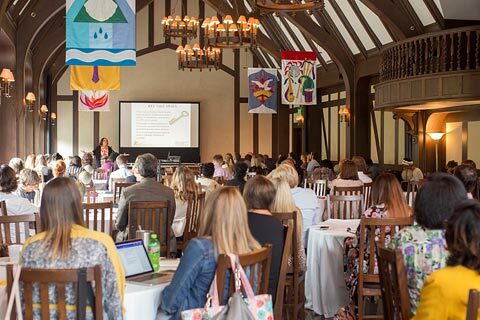 “Creating and sustaining these ongoing partnerships between schools and mental health agencies is critical to support children and families,” said Julie Hannah, Samford assistant professor of educational leadership. “Partnering for School Mental Health: The Power of Collective Impact,” was funded by Samford University’s Orlean Beeson School of Education and the Mike and Gillian Goodrich Foundation of Birmingham, but would not have been possible without the vision and groundbreaking work completed by UnitedWay of Central Alabama, Bold Goals Coalition, Jefferson County Health Action Partnership and the Community Foundation of Greater Birmingham, Hannah added.